The ideal point to open up long positions is when a market experiences a crash like move hence the saying buy when blood is flowing freely in the streets. The masses are always on the wrong side of the markets; from the tulip mania to the last market meltdown which took place in 2008; they have always been on the side. The green circles in the chart below highlight the best entry points. 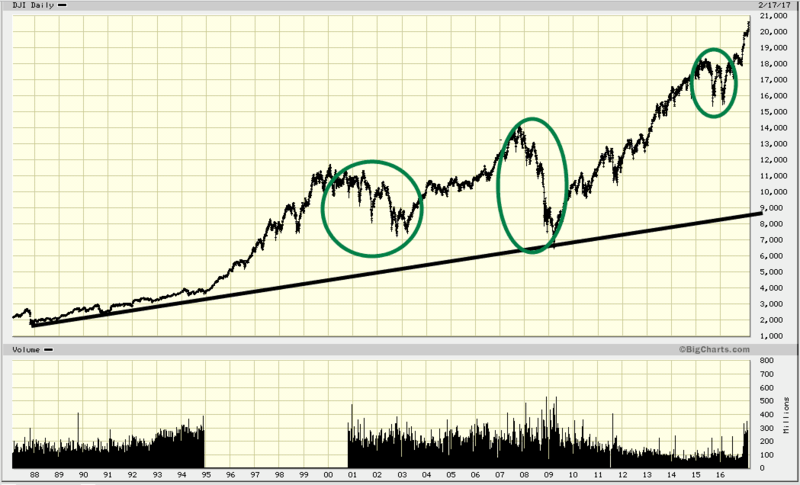 However, this is a very long-term chart and some pullbacks might not look as strong. Remember, if the trend is up as it currently is, you should be salivating at the prospect of such a substantial pullback. In July 2015 we welcomed a healthy pullback, we embraced sharp pullbacks in Jan and Feb of this year, and we will embrace it again as long as the trend is up. There is no reason to panic at the possibility of a strong correction. We are already preparing for such an event, and as of today, we are going to take a defensive posture. Fear always comes in the way of opportunity; you need to understand that. At the present time, it is best to hold your gunpowder until the market pulls back strongly. History indicates that after a very strong run-up, the market usually experiences a relatively strong pullback. We might be in for a stronger than expected correction; we are not stating the bull is over, and we will not state that until the trend change direction. However, given that the pendulum swings in both ways; the risk to reward ratio from a psychological perspective is not in our favour. This crowd is always skittish, so one hard slap of fear and they will crumble and scuttle for the hills; as the trend is up, the stronger the pullback the better the opportunity. When it comes to trading, panic is the code word to buy. And remember, the right time to buy a stock is when everyone thinks its time to sell and hide. Focus on the simple factors, for that is what helps determine the trend; factors such as mass sentiment, and extreme patterns (technical analysis) on the charts. The news is not an essential factor; in fact, toilet paper has more relevance than news; at least it serves a noble function; one cannot lay the same claim to news. Anyone that advocates giving into fear should be thrown head first out of the front door(figuratively speaking that is) and never allowed back into your house or mind; fear never pays off; only the vendors of fear will make a handsome buck, the buyers will lose their pants, their shirts and their knickers too. Experts and or Market timers have such a dismal record and why they will continue to fail for the foreseeable future. These guys might get it right once, and in almost every case that is due to pure luck, for they fail to become two hit wonders. Market timing based on fundamentals and technical analysis always fails, and there is a reason for this colossal failure. 90% of advisers, experts, financial commentators do not know what they are talking about, which means the same rules apply to the masses. Want proof look, go back and look at how they repeated the same nonsense each time the markets were crashing and or surging upwards. They screamed that the world was going to end when the markets were pulling back, and they alluded that the Milky Way was the next stop for the bull market when it was rising. In both cases, they failed to spot the so-called top or the bottom. No matter how many times we try to warn traders about the dangers of giving into fear, a significant portion of traders give into it and follow the well-trodden path of failure. There is not one single trader in the world no matter who he or she is that can pull up a long term chart and prove that the following statements are false. 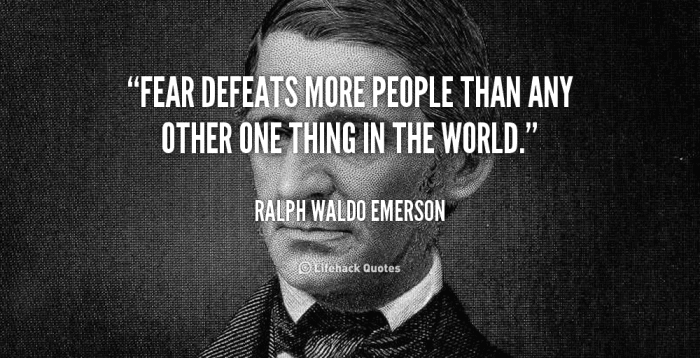 Giving into fear always leads to a negative outcome when it comes to trading. In a nutshell, one can only win if one conquers the demon of fear; if one does not, it is just a matter of time before that person is separated from their hard earned money if they are investing in the markets. Following the mass mindset is very dangerous; the outcome is always negative. No matter how any expert wants to spin it, there is no way to prove that back-breaking corrections or stock market crashes are nothing but stock buying opportunities over the long run. If one wants to speed up their retirements, the best tactic would be to build up cash during the last phase of a bull market; the phase where the masses start singing. Additionally one can consider living 1-2 standards below one’s means; this should not be too hard as most individuals live several orders above their means. When the markets crash, use simple sentiment analysis and technical analysis to identify bottoming action and load up on quality companies. Secondly, subscribe to our free newsletter to keep abreast of the latest developments. Change begins now and not tomorrow, for tomorrow never comes. Understand that nothing will change if you do not alter your perspective and change your mindset. If you cling to the mass mentality, the top players will continue to fleece you; the choice is yours; resist and break free or sit down and do nothing.